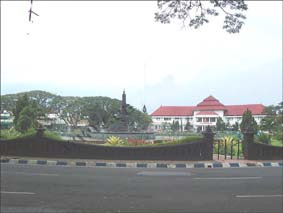 Malang is one of clean and cool cities in East Java has, without any doubt, been famous since long time ago. Historical remnants scattered around Malang showing that it had played important roles in many eras and stretching out from 112° 17' 10, 90° up to 112° 57' 0,00° East Longitude and extending from 7 44' 55,11° up to 8°26'35,45° South Latitude. Malang Regency border Blitar and Kediri Regencies on the West; Jombang, Mojokerto and Pasuruan Regencies on the North; Probolinggo and Lumajang Regencies on the East and Indian Ocean on the South. Malang, which is noted as one of the most fascinating towns in East Java lies 90 km away to the South of the capital province, Surabaya. It's just a nice place to stay Malang has now become the educational, industrial as well as tourism center. It has seven districts, one administrative town, thirty five sub districts, sixteen ward administrative units and three hundred ninety urbane villages. In the mean time, a wide companies: cigarets, coconut oil, and many others have become familiar land mark in Malang Regency including the "Topeng" (Mask) handicraft at the villages of Jabung - Pakisaji and Kedungmonggo - Pakisaji and other kinds handicraft of wood or traditional ceramics at the villages of Junrejo - Batu, Bululawang, Wajak etc. As a center of tourism, Malang has a lot of places of interests which are classified into local, regional, national and international standards, including traditional art performances such as; Topeng (Mask) Dance, Jaran Pegon, Tari Beskalan (Beskalan Dances) etc.